The standalone Obi-Wan Star Wars movie is reportedly in talks with a potential director, taking a step forward from 'this idea has to happen' to 'oh heck yeah this idea is actually happening'. According to The Hollywood Reporter, Stephen Daldry is in "early talks" with Lucasfilm to direct a cinematic story about the Clone Wars hero turned weird old desert wizard. Daldry's filmography is largely composed of acclaimed dramas, including Billy Elliot, The Hours, and The Reader. An unexpected pick for a blockbuster action franchise? Sure, but so were The Lego Movie's Phil Lord and Christopher Miller for the Han Solo movie. Hopefully Daldry pans out better than Lord and Miller, who were replaced by Ron Howard late in the Han Solo movie's production. In any case, Lucasfilm is clearly interested in branching out to tell different kinds of Star Wars stories outside the main trilogy. According to the report, Daldry will oversee the Obi-Wan movie's writing and direction (along with Lucasfilm, of course) if the deal goes through. There's no script yet so there's no casting either. In other words, we don't know whether Ewan McGregor will reprise his role as Obi-Wan from the prequel trilogy. McGregor himself has said he would be up for donning the dusty brown robes once more - in fact, he already came back to do a little voice over work for Rey's vision in Star Wars: The Force Awakens. 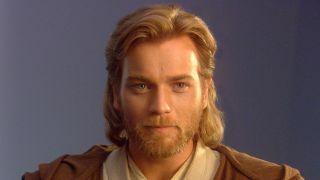 Ewan McGregor is the perfect age to portray a middle-aged Obi-Wan, looking after young Luke Skywalker's safety and anonymity from a distance. And Daldry's drama chops would make him a great choice for telling the story of a difficult time in the Jedi Master's life, living in solitude as he grapples with guilt and despair over Anakin's fall to the dark side. How does he go from that to the placid nobility Alec Guinness portrayed so well in A New Hope? That's just one idea, of course - maybe the movie will be about Obi-Wan's adventures as a ghost, going to ghost college and getting into trouble with the dean of ghosts. Who knows! For a better look at the immediate future of Star Wars, read our Star Wars: The Last Jedi news recap.